WHAT HAPPENED: With Syracuse up 33-28 with 16:33 to go, Tyus Battle broke out of his recent funk and scored 10 straight points for the Orange. His jumper with 11:31 left gave the Orange a 43-36 lead, one that would balloon up to 19 points with two minutes to go after Paschal Chukwu’s tip in. That allowed the Orange to shake off a rough offensive first half where it scored just 24 points and went into intermission tied. ANALYSIS: Now that we are approximately one third of the way through the season, we know what Syracuse team we’re dealing with. This is not a team that will overpower teams with a high-scoring, fluid offense. Instead, the Orange will need to grind out games much like it did against the Eagles. Syracuse won despite shooting 37 percent from the field and 6 of 20 from downtown. On the other hand, SU can likely keep pace with the elite teams in the ACC thanks to its defense, which stifled Eastern Michigan. The Eagles were held to 37 percent shooting from the field, 3 for 15 from downtown, and also coughed up 14 turnovers. 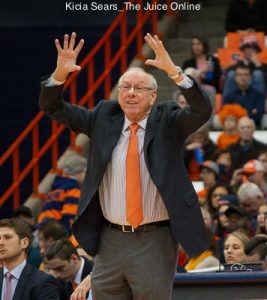 If the Orange can find better footing on offense, it has a chance to slip into the upper tier of its conference. 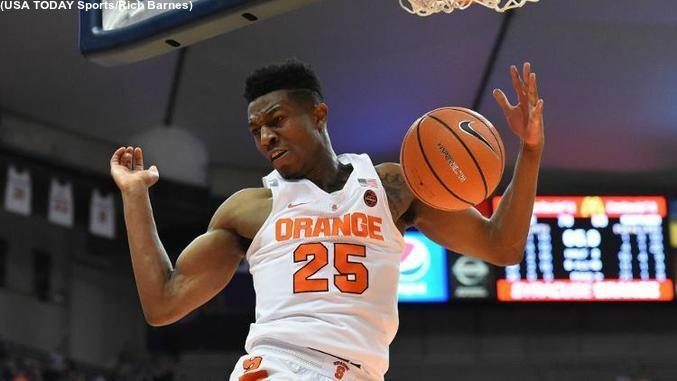 HERO: After a 1-6 performance in the first half, and a fifth consecutive half in the offensive doldrums, Tyus Battle caught fire in the second half, finishing with a game-high 22 points on 7-15 shooting. Chukwu had his best offensive performance of his college career, with 15 points to go along with 12 rebound and five blocks. ZERO: Chukwu had an opportunity to play extended minutes with his backup, Bourama Sidibe relegated to the bench as he continues to deal with knee and ankle issues. It wasn’t a problem against a MAC team, but the Orange will need a healthy Sidibe in conference play. Syracuse coach Jim Boeheim mentioned post game that a medical redshirt may be on the table for Sidibe, which would be another big blow to SU’s depth. The Orange would be down to only seven scholarship players if Sidibe was ruled out. WHAT’S NEXT: Syracuse begins ACC play, hosting Virginia Tech on New Years Eve at 6:00 p.m. at the Carrier Dome. TV: ESPNU.